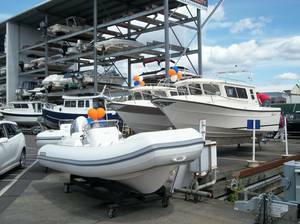 Waypoint Marine Group offers comprehensive sales and service for a wide variety of pre-owned vessels as well as New Boats from top quality manufacturers, which include SeaSport, C-Dory, Raider, Osprey, Skagit Orca and Avalon Pontoon Boats. Inflatable boat brands include AB, Walker Bay, Inmar and ZAR. We are your local authorized sales and service providers for Honda, Suzuki, Yamaha, Volvo Penta, and Mercruiser. Purchasing a boat is an exciting experience! Whether you're looking for quality pre-owned or new, the staff at Waypoint have the technical expertise and the local knowledge needed to answer all of your questions accurately and thoroughly. Helping you through the necessary research process and getting you into a boat that is suitable for your intended use is what we are all about. With over 100 years of combined service experience in the marine industry, we will be able to answer your questions before, during and after your purchase for years to come. Representing proven and respected brands is no accident at Waypoint. We have done a lot of research on our own and have carefully chosen the manufacturers that we are proud to represent. 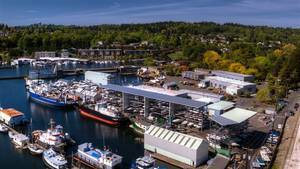 We know that we are providing our customers with quality built boats, designed for use in the Pacific Northwest and beyond when we show them a SeaSport, C-Dory, Campion, Raider, Osprey, Skagit Orca or Avalon Pontoon Boats. Our dealership, service center, marina and dry storage facilities are dedicated to providing the highest level of professional sales and service. The boating lifestyle will bring you closer to your family, friends, and colleagues. Waypoint will help you make the best choice so that you can enjoy your time on the water as much as we do! Thank you for visiting our YachtWorld.com site. We look forward to hearing back from you or having you visit our dealership! Highly desirable head-turning cuddy cabin Cobalt. With high class options that make this boat ultra comfortable - it includes a convertible cuddy that will accommodate two for berthing; sliding and store-able chemical head; and cabin heating. This Cobalt also features thru-hull exhaust; transom stereo controls; transom wash down hose; ski tow; and flip-up bolsters. A great boat for cruising and playing too! Additionally, the seller has just replaced all the zincs, installed brand new cockpit snap-in carpeting, and replaced the swim ladder with a shiny new one. The black canvas cover is in great shape too, and so is the gel coat. Come check this beauty out and see if she's a good fit for you! The Cobalt 263 is the yacht-certified cuddy companion to the 262 bowrider. The stringer system is all-fiberglass construction, as is the cockpit?s liner deck. The transom has been fashioned of composite materials, and the hull has been reinforced with Kevlar. In the cabin, directly in front of the dash, stands a very large cedar-lined locker. A large settee will sweep around the bow, with filler cushions (stored in the sidewall) ready to replace the center table. The effect: a six-foot U-shaped couch, in the manner of a big, big bowrider. The 263 has exceptional headroom, and a lower galley with a sink and space for a single-burner stove is both efficient and easy to use.